My name is Jodie and I live in the exquisitely scenic riverside community of Echuca Moama with my husband Matt and three children. My formal grounding is in early childhood education, but I established Twinkle Star as a creative outlet five years ago so I could live my passion and remain at home with my young and expanding family. Pre Twinkle Star days – armed with a Bachelor of Arts and a Bachelor of Teaching (birth to five) – I carved out a rewarding career working with children, the highlights of which included assisting additional needs children, teaching certificate 111 in children’s services, and managing a long day care centre. I have three twinkling little stars in my life, Mackenzie 7, Harry 5 and Ben 2. Twinkle Star is a boutique quality children’s clothing label specialising in stylish, playful and modern designs. I design and create clothing children love to wear again and again and again! The Twinkle Star range caters for newborns up to size 10 and includes dresses, skirts, shorts, harem pants, rompers, nappy covers, appliquéd and embellished tops and matching hair accessories. I also release special ranges for Christmas, Easter and Valentine’s Day and enjoy designing personalised birthday outfits. It is my burning ambition to create amazing children’s clothing, which is unique, high quality and affordable. I absolutely adore fabrics that are bright, vibrant and fun. I particularly love floral fabric and polkadots, and while I can often be found working with soft pastels, my heart belongs to bold. I use 100% designer quilting cottons which are fantastic quality and wash and wear well. The clothing styles I create must be comfortable, practical and look great. My children are my harshest critics but their feedback is invaluable. I am obsessed with colour… my fabric stash is proof of that and it is my biggest inspiration. I will often purchase fabric because I know it will look fabulous made up in a particular design, even if that design hasn’t been created.. yet! I carry around a note book which is filled with sketches, new colour combos and pattern ideas. Some of these jump off the page, on to my machine and into my store. All designer have “flat” days where inspiration will escape us. But I all need to do if flick open my book, pick a page and work on something new. I have been creating since I was very young, so you could say it is in my blood. I still vividly remember using mum’s sewing machine to sew together a couple of pieces of fabric to make my Barbie a dress. The arm holes were just cut out and the dress didn’t last long, but I was hooked! I also recall making hundreds of “scrunchies” as a young teen. I loved Home Ec at High school and spent many precious times with my beautiful Nana who patiently helped me create numerous elaborate formal dresses in my late teens. I worked in long day care and preschools prior to having children. One of the highlights of working with young people is sharing stories and songs.. I often asked the children what songs they wanted to sing, and the all-time favorite was “twinkle twinkle little star” – often shortened to “twinkle star”. When I was considering business names, it was important to me that it relate to children and be unisex. “Twinkle Star” captured those key elements perfectly. 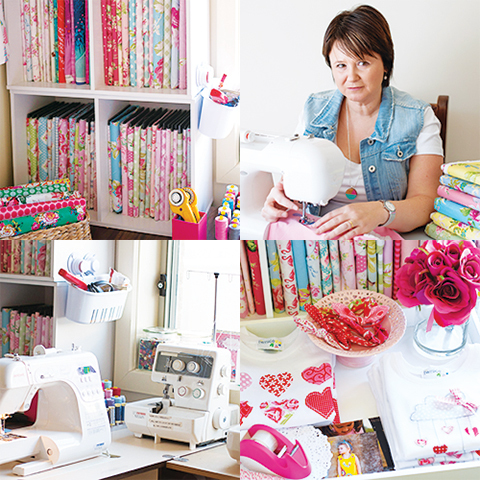 I have a borderline addiction to Pinterest and Youtube when it comes to fueling my creative needs and I rely on the wealth of information available in Australian made patterns, sewing groups and blogs. I have also completed a set up shop course to assist with the online aspect of my business. Find something that when you wake in the morning, it is pushing you to get out of bed. Something that you want to build a future with. One of the most important things with any business is the customer base, so always make time to have great customer service, and last but not least be true to yourself, but also true to your brand. I believe it is about building a brand that people can trust and follow. Your fans become your biggest and best advertising tool. Keeping your brand consistent and current is also important, which means being active on social media and connecting with your customer base as often as you can. Pace yourself and keep a balance. From what I have seen, and have come very close to experiencing myself, the single biggest threat to small creative businesses is burn out. So where you can have a support network that you can turn to, people in the industry that understand you and your situation. People that can help you when you need that little bit of extra support. Oh this is a tricky one – a day where my children all get along blissfully, where I can spend a few hours uninterrupted in my studio followed by a lazy lunch at my favourite restaurant and topped off with an afternoon of retail therapy. Milbos - Jo from Milbos for her passion, talent and support.